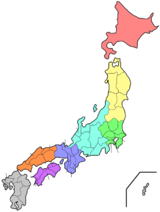 තෝහොකු කලාපය (東北地方, Tōhoku-chihō, Tōhoku region?) යනු ජපානයේ හොන්ෂූ දූපත ආශ්‍රිතව පිහිටි කලාපයකි. ↑ Ministry of Internal Affairs and Communications Statistics Bureau (26 October 2011). "平成 22 年国勢調査の概要" (PDF). සම්ප්‍රවේශය 6 May 2012. මේ පිටුව අන්තිමට සැකසුවේ 2 මාර්තු 2019 දින දී, 17:41 වේලාවෙහිදීය.